When is an ECM album not an ECM album? Two new releases from, respectively, Yelena Eckemoff and Mike Nock/Laurence Pike provide compelling answers. Given the musical synergy on display, it’s appropriate that Everblue’s album cover bills the band as the Yelena Eckemoff Quartet. But despite the collaborative spirit that infuses Eckemoff’s record, hers is not a working group. The Mike Nock/Laurence Pike duo, on the other hand, is. Beginning and End of Knowing (2015) is their second record—following Kindred (2012)—and this Australian piano/drums project is a gigging concern, playing wholly improvised shows that match their wholly improvised approach at recording sessions. To record Beginning and End of Knowing over two days in 2015, producer Pike arranged for the pair to visit Rainbow Studio. Like Yelena Eckemoff an admirer of the ECM aesthetic, Pike judged Jan Erik Kongshaug’s coolly Nordic studio sound appropriate for his Antipodean duo with Nock. And the ECMblance doesn’t stop at recording quality; the album’s cover follows the design typical of ECM’s 1980s releases. See the front cover of John Surman and Jack Dejohnette’s The Amazing Adventures of Simon Simon (1981) for comparison. Independently produced, the new Nock/Pike disc appears on FWM (Fourth Way Music) Records, named after Nock’s ‘60s/’70s U.S.-based fusion group The Fourth Way. The veteran Australian pianist, now 75, is himself intimate with the particulars of record production. From 1996 to 2001 he acted as music director of Naxos Jazz, the sadly defunct Naxos imprint for which he oversaw production of over 60 CDs representing a truly international artist roster. I’m personally a big fan of those releases, which included several dates led or co-led by Nock on piano. As leader or co-leader, Mike Nock’s now recorded some two-dozen records since 1967, but the one to which Beginning and End of Knowing implicitly pays homage would have to be Ondas. A trio session issued under Nock’s name, that album was recorded in 1981 at Talent Studio, Oslo (Rainbow studio was not built until 1984). Label? ECM. Drummer? Jon Christensen. And recording engineer? Yes, Jan Erik Kongshaug. Fast-forward several decades and you’ll find Mike Nock playing with a drummer not unlike Jon Christensen’s current, rhythmically radical self. “[Laurence] Pike’s drumkit,” explains Mike’s website, “abandons a solely rhythmic responsibility and becomes an instrument for percussive ornamentation and near melodic contributions of accents, conjunctions and punctuation.” Along with drums and cymbals, Pike plays drum pads to trigger live electronics. He’s been honing his technique in company with Nock since age nineteen; roughly forty years separate the two men. But on Beginning and End of Knowing the point where age begins and youth ends—likewise, mentorship and apprenticeship—is indeterminate; this dyad performs as a single intuitive organism. As captured at Rainbow Studio, such single-minded artistry resulted in a series of twelve organically flowing yet artfully differing miniatures, ranging from two to five minutes in length. Despite sparse instrumentation and unceasing seat-of-the-pants improvising, the album should prove accessible even to those non-habituated to fully improvised music. 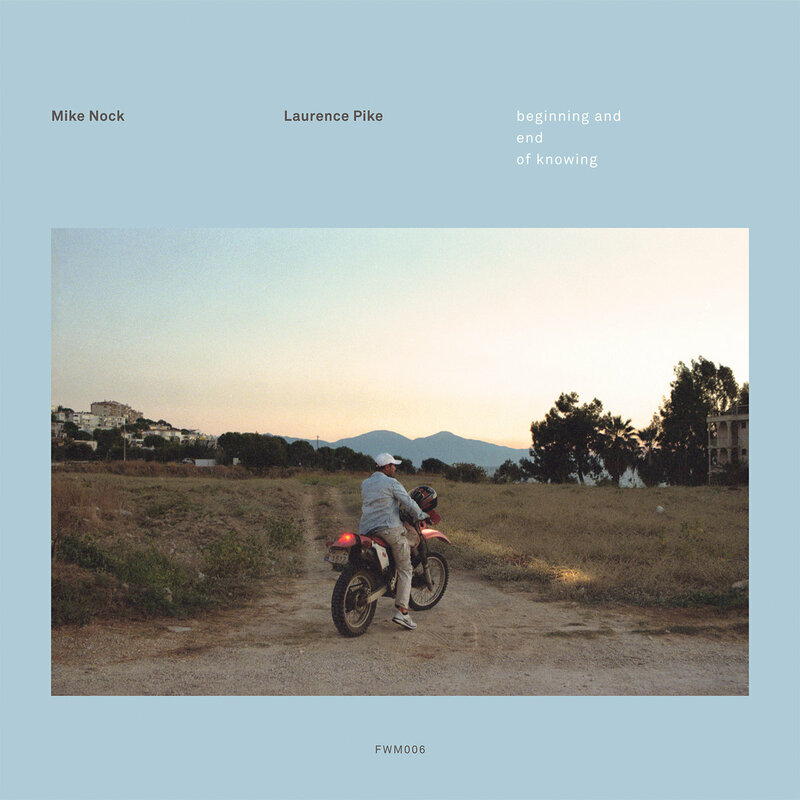 Like recently deceased piano titan Paul Bley (1932-2016), Mike Nock has a gift for instant composition, plucking songful note combinations from above and communicating them intact to earthbound ears. On the opening title track Nock’s lyrical impulse emerges hushed and reverent, with notes widely spaced—but only forty-five seconds in, after his partner’s set the scene with a full-on circus collage of drum rolls, rimshots, cymbal pings, hi-hat susurrus and some species of cricket-like chatter. Pike’s ambidexterity’s octopus-worthy: “Look, Ma, eight hands!” Two-thirds in, amid this multidirectional scamper, Mike turns more insistently rhythmic then gradually slows down and quietens into silence. The following piece, “Cloudless,” sounds appropriately tranquil—a reverie on the beyond. Here Laurence Pike sounds entirely less agitated, with quiet brushes on snares and judicious cymbal accents. And the recording itself sounds marvellous, registering everything with pin-drop accuracy. Kongshaug’s Rainbow Studio has done Pike and Nock proud. “1000 Colours” too is appropriately titled, for it shows Mike excitably spanning the spectrum. Hear his hands constantly shift moods between exploratory agitation, soulful funk and spiky neoclassicism. And through it all you can hear him vocalizing (thankfully less obtrusively than Keith Jarrett). After initially jittery percussion, Pike settles into something like conventional jazz timekeeping. While there’s nothing actually conventional about this duo’s music, it remains melodically appealing and approachable even when most mercurial. Listen, for example, to “The Mirror.” After opening with a seesawing, whimsical figure punctuated subtly by Pike, Nock navigates a yearning main theme through a half-lit, secret landscape. His vocalizing urges the melody on, reflecting the effort of minting it. For fifteen seconds the pianist’s final note rides the reverberant studio acoustic, which clinically documents its dying fall. This all-improvised ballad sounds as gorgeously affecting as anything committed to staff paper. Perhaps the album’s centerpiece, “Glittering Age” comes across as the most overtly eventful track. Here Pike’s drums and cymbals are underpinned by a further, near-subliminal percussive layer: constant crashing waves of metallic surf, presumably triggered by drum pads. This element imparts a steady heartbeat while Pike’s drumming constantly evolves to complement the restless pianism at hand. Veering between Bley and Bach, Nock elaborates a threadbare note pattern into an increasingly rich tapestry, a process abetted by Pike’s adventure playground’s worth of embellishments including generous snare rolls and clacketing rimshots. “Zerospeak” is tom-dominated, Pike apparently playing with his hands and only turning to hi-hat and cymbals, and eventually kick drum, halfway through. The musical conversation here’s particularly intimate, Pike’s drumming and Nock’s breakneck skittering keyboard lines cleaving closely to each other. On this disc replete with riches, the joyful “Ocean Back to Sky” stands out as my favourite cut. It begins with sampled grandfather clock chimes, Pike counterpointing their rhythm with his own peculiar clockwork. Soon Nock enters probingly, gradually starting a chant-like amble that Pike adopts companionably like a fellow backpacker falling into stride. At about the halfway mark Nock guides them into lullaby territory, lending radiant accompaniment to some sunlit nursery scene. Clearly audible to this point, the grandfather chimes become largely obscured by heightened melodicism and revised rhythmic bustle, but they persist inexorably to the end. In the face of such metronomic predictability, these musicians—here and throughout the record—playfully dispense a wealth of wide-eyed discoveries and off-kilter delights. Call it what you will—cat-and-mouse game, musical Socratic dialogue, or two guys’ improv equivalent of Kinderszenen—this Laurence Pike/Mike Nock project’s as endlessly fascinating as its title implies. And like Yelena Eckemoff’s Everblue, moreover, Beginning and End of Knowing is endlessly enjoyable. I urge you to lend both albums your ears.